Over the past decade there has been increased interest in the roles that people with lived experience can play as peers in supporting the recovery of justice-involved adults diagnosed with mental illness and addiction. Peer services encompass a range of activities and interactions between people that inspire hope for recovery, dispel myths about behavioral health conditions, and empower individuals to engage with recovery and treatment services available to them. Behavioral health peer supporters are trained team members who share the experience of having been diagnosed with and have exhibited sustained recovery from mental illness or addiction. In the justice system, peer services range from volunteer mentors to certified and paid peer specialists. In the behavioral health field, peer support has been shown to be effective in increasing satisfaction with services, an individual’s sense that treatment is responsive, and feelings of empowerment; improving engagement in self-care and wellness; improving quality of life, community integration, and social functioning; and decreasing symptoms of mental illness, hospital admissions, and substance use, among other positive outcomes (Davidson, Bellamy, Guy, & Miller, 2012; Pitt et al., 2013). As the role of peer support in criminal justice settings has expanded, early analyses of related program performance have yielded encouraging results, including decreased recidivism and alcohol use among people with severe mental illness (Randall & Ligon, 2014; Rowe et al., 2007). Government agencies, problem-solving courts such as drug courts and veteran courts, treatment providers, peer-run organizations, and others have sought guidance on how to successfully integrate peer support services into criminal justice settings. In response to these needs, SAMHSA recently convened an expert panel meeting to begin the process of developing a comprehensive strategy for providing guidance to the field in this area. The meeting was held May 2-3, 2017, at SAMHSA headquarters in Rockville, Maryland. 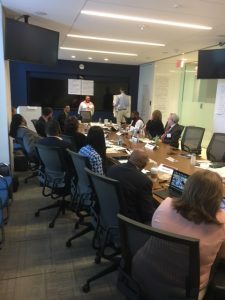 SAMHSA invited a diverse group of panelists to participate in the meeting including representatives from national associations, state behavioral health and criminal justice agencies, treatment court programs, recovery communities, peer-run organizations, managed care organizations, and training and credentialing organizations. All of the panelists had either been involved or are currently involved in activities related to the implementation of peer support in criminal justice settings. As a way of organizing the discussions during the meeting, the expert panel began by looking at the Sequential Intercept Model. Chanson Noether, Director of SAMHSA’s GAINS Center for Behavioral Health and Justice Transformation, provided an overview of the model and discussed some of the challenges and opportunities associated with implementing peer support services at each of the intercepts and how peer support can be integrated into programs and services that aim to assist individuals during crisis and prevent any formal involvement in the criminal justice system. The expert panel explored the current status of peer support services in criminal justice settings, the wide spectrum of peer support roles and the language used to describe those roles, some of the unique challenges associated with implementation, promotion strategies, and best practices and core competencies (for both individuals and organizations) specific to implementing and providing peer support in criminal justice settings. Participants agreed that collaboration between justice, treatment, and peer service agencies will bring about the structure and support needed to implement successful peer support programs. During the following week, SAMHSA’s GAINS Center convened a group of peer leaders to review core competencies necessary to provide peer support in criminal justice settings. During the first day, the group identified several performance domains where core competencies were essential for peers working in criminal justice settings. These domains included Advocacy, Mentoring/Shared Learning, Recovery and Wellness Support, Foundations of the Criminal Justice System, Trauma Informed Care in Criminal Justice, Reentry and Regaining Citizenship and Professional and Ethical Responsibilities. The second day was devoted to detailing the tasks falling under each domain. What emerged was a clear view of each domain and the job tasks that should be performed under each domain to demonstrate competency in each domain. These meetings were essential to prepare both the peer workforce to support recovery for people with behavioral health disorders in a vast array of criminal justice settings and to provide guidance to criminal justice settings on how to effectively integrate peer staff in these settings. Thanks to the peer leaders who shared their expertise with us. Thanks to SAMHSA staff for their ongoing support for these initiatives. For help identifying peer agencies in your community or region, call the GAINS Center at 800-311-4246. Davidson, L., Bellamy, C., Guy, K., & Miller, R. (2012). Peer support among persons with severe mental illnesses: A review of evidence and experience. World Psychiatry, 11(2), 123-8. Pitt, V., Lowe, D., Hill, S., Prictor, M., Hetrick, S., Ryan, R., & Berends, L. (2013). Consumer providers of care for adult clients of statutory mental health services. Cochrane Database of Systematic Reviews, 3. Rowe, M., Bellamy, C., Baranoski, M., Wieland, M., O’Connell, M.J., Benedict, P., Davidson, L., Buchanan, J., & Sells, D. (2007). A peer-support, group intervention to reduce substance use and criminality among persons with severe mental illness. Psychiatric Services, 58(7), 955–961. If you need additional input about peers/volunteers in criminal justice, I ran a mentoring program for women leaving prison in RI for 17 years. While the program no longer exists, I do have published qualitative research on it. Also I am currently overseeing the infrastructure development of peer recovery services in RI and am a person with lived mental health experience. Hi Judy! I was blessed to have been one of your mentors at the ACI. I would love to reconnect to talk about my current position working in a jail in Maine. My co-worker and I are trying to organize a peer mentoring program there. I am a Forensic Peer Support Specialist. Any information on the Peer support in Criminal Justice Settings would be very helpful. Where can I get a copy of the job tasks under each domain? Hello and thank you for your interest in the work products from this meeting. The core competencies are not available for public use at this time. They will be made available in the coming months. Please subscribe to the GAINS listservto be notified when the materials are released! Hi-Curious if you will be releasing highlights, recommendations, etc. which emerged from this meeting. Particularly interested in peer support with regard to law enforcement response to mental health calls for service. Thanks! Hello my name is mark: I am currently enrolled in New York state mandated reporter resource center training course, and I will be attending classes at the Albany Certified Recovery coach pure training academy. The first one is for mental health peer-to-peer advocacy and the second one will be for drug and alcohol abuse advocacy. Would I need any other additional training to become a peer advocate in the legal system? If so what else should I obtain to further my education and my career option. I reside in Utica New York and if you have any information of any facilities in this area it would be greatly appreciated if you could pass them on to me.